All transactions are safe and secure with a reliable history in online purchasing behind each of our associates. Buy the Hangover Weenis t-shirt to own Hangover 2 clothing and merchandise. 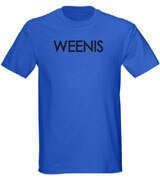 This Hangover Weenis t-shirt was designed with Alan fans in mind since he uses the term quite often. In the first film, he uses it when referring to Carlos at the table saying, "He's jackin' his little weenis." In the second he claims, "When a monkey nibbles on a weenis, it is funny in any language." He delivers the quote after playing a joke on a bus. The design is also done in the same style of lettering as the movie logo for a nice added touch. In addition to the Hangover Weenis tee above, browse the Hangover 2 Clothing Gallery for more apparel like men's and women's clothes, kids shirts or hoodies.